Limitless possibilities. Just do what you feel like doing. Bring your loved ones for a family break, spend time with your friends on a group holiday or escape to the mountains for a romantic getaway for two. Andy enjoys a prime setting in Jerzens in the Pitztal in Tirol within easy reach of the family-friendly skiing and hiking area Hochzeiger. Our 24 exclusive premium apartments and 14 stylish double rooms offer the comfort and amenities of a top-notch hotel, complete with a spacious spa area and à la carte restaurant. The hiking paradise starts right on your doorstep. 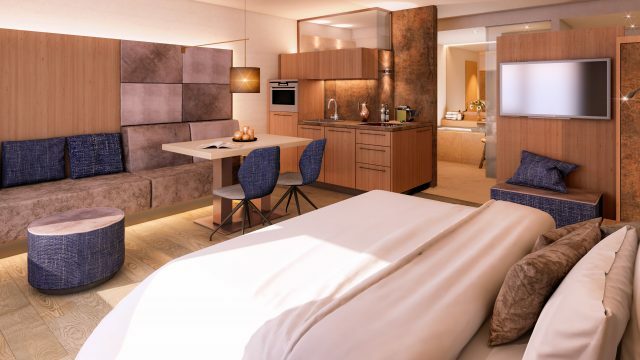 In July 2019 ANDY will become a 4-star superior hotel apartment featuring 24 exclusive apartments and 14 comfort double rooms. All accommodations include breakfast. New will be our shop selling regional products and an à la carte restaurant with bar at the hotel. The Pitztal valley in Tirol boasts a total of 380 kilometres of signposted hiking and Nordic Walking trails in three hiking areas. The Pitztal valley in Tirol is a perfect destination for mountain bikers offering numerous signposted trails in all ability levels. Hochzeiger is the perfect ski area for all winter sports enthusiasts who are looking for a cozy and family-friendly atmosphere.